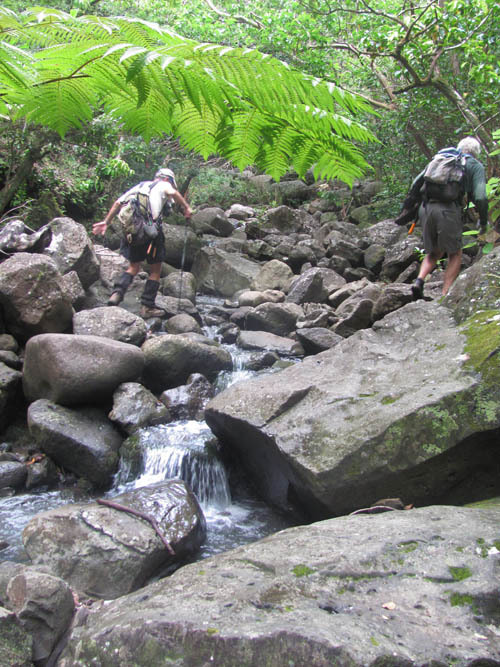 I joined the trail maintenance crew of the Hawaiian Trail and Mountain Club (HTMC) to clear the trail that leads to the waterfall at the end of Koloa Gulch. Pushing-off from Kokololio Park in Hau’ula we made our way along Kamehameha Highway and turned up a dirt road to the trailhead. 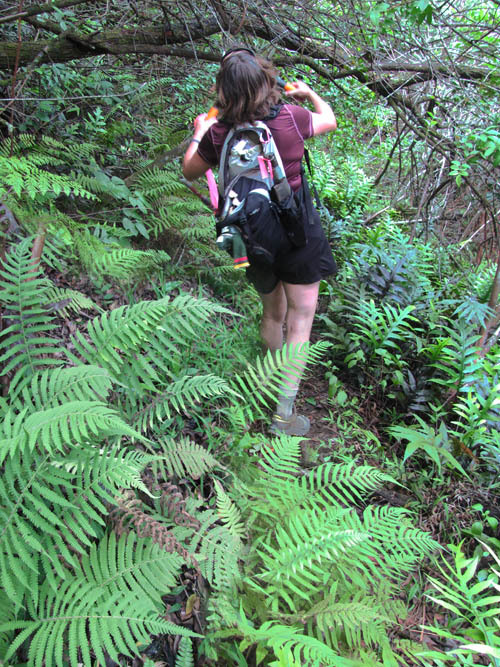 After briefly climbing up a ridge we veered-off the ridge line and descended into Koloa Gulch. 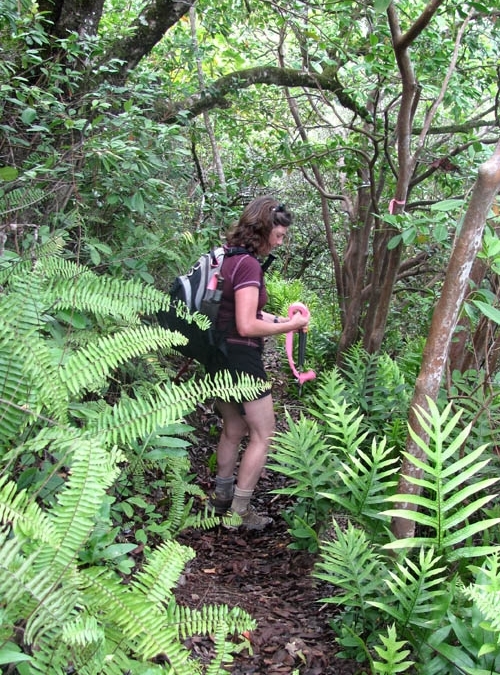 Thea Ferentinos, our leader for the hike, tied ribbons on strawberry guava trees to mark the trail that drops down into Koloa Gulch where native kupukupu ferns and introduced lauae ferns thrive. 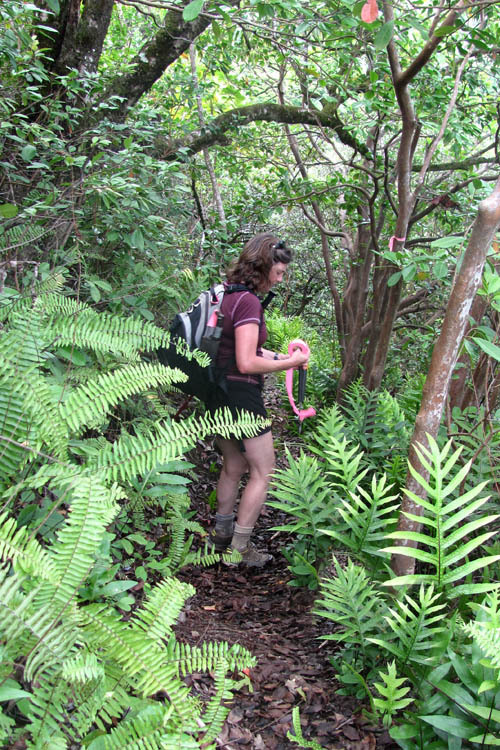 Using loppers, saws and other tools, we cut christmas berry branches that dropped down to block the trail where sword ferns thrived in the understory. 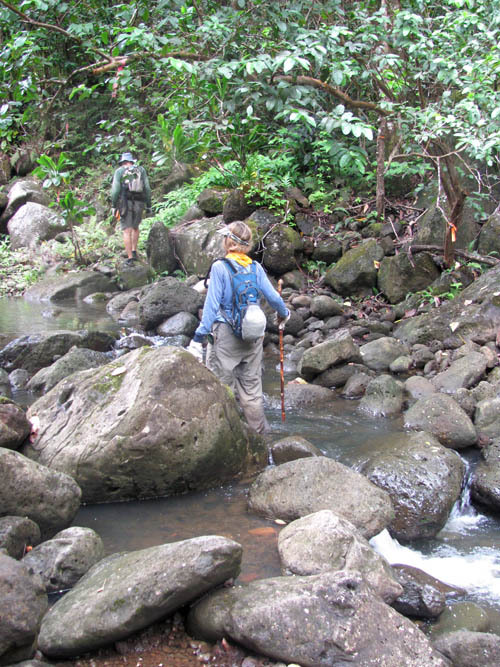 Due to rainfall in the mountainous interior of the island, there was considerable stream flow when we reached the bottom of Koloa Gulch. 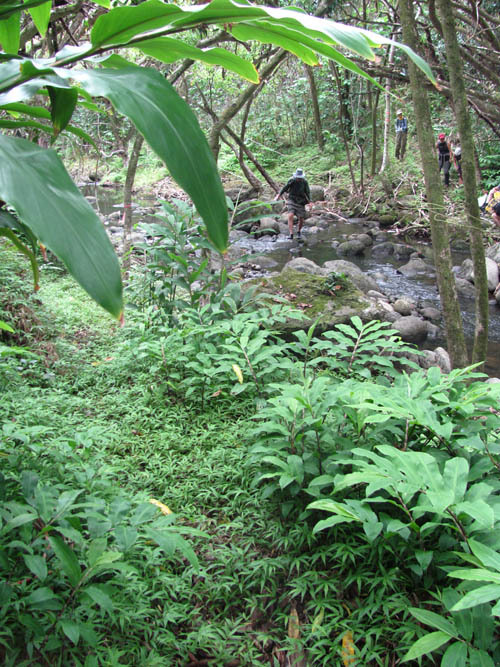 After crossing the stream — the first of several dozen — I admired the honohono grass that carpeted the trail, shampoo ginger along the margins, and yellow ginger that grew overhead. 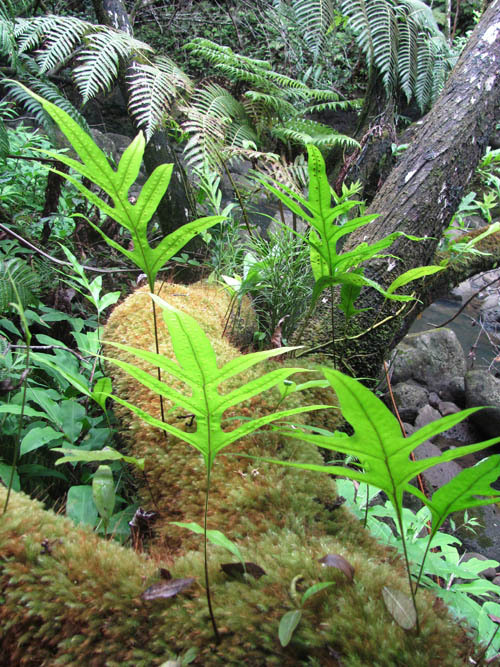 One of my favorite things to visit in Koloa Gulch is a tree covered with moss and lauae ferns. I was thrilled to see the fronds back lit from above and lingered for quite some time admiring and photographing the sight. Much of the work for the day involved cutting blown down trees. 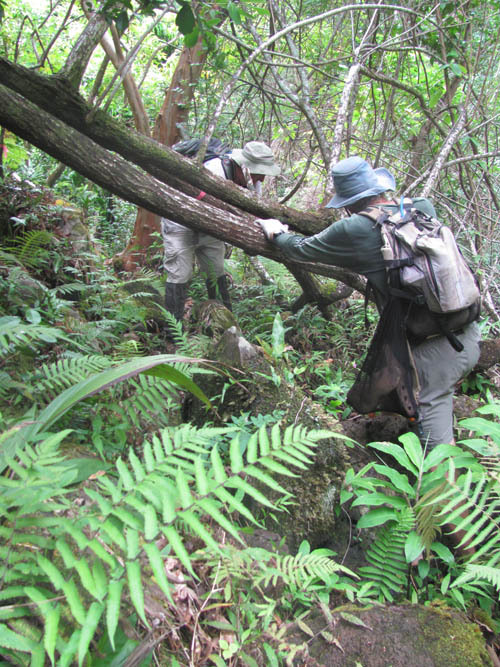 Mike and John made quick work sawing through invasive christmas berry trees that blocked the trail. Hopping from boulder to boulder, we crossed the stream dozens of times during our hike to the end of the gulch. While most of the boulders were round and smooth, rocks that fell more recently were more angular and had sharper edges. Groves of hala trees with slender trunks thrive in the gulch. 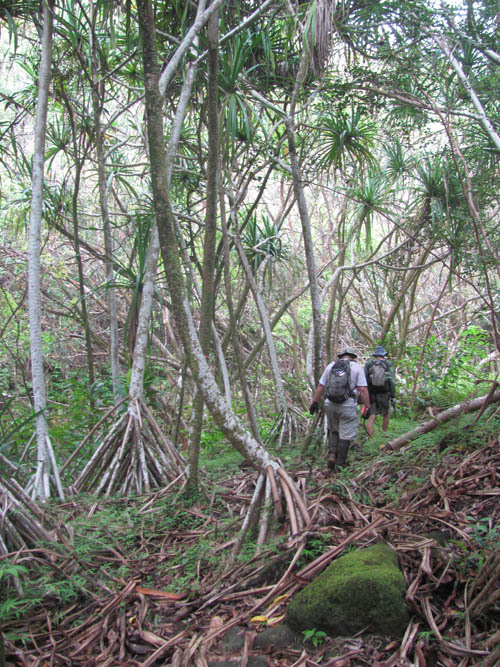 These trees are quite different from hala trees on the Big Island, which have considerably thicker trunks. 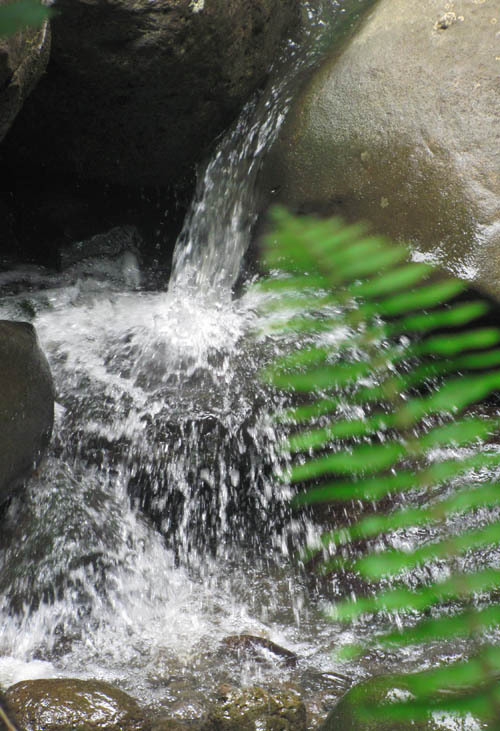 Many miniature waterfalls make their way between the boulders and splash down the stream bed amidst charming native ferns. 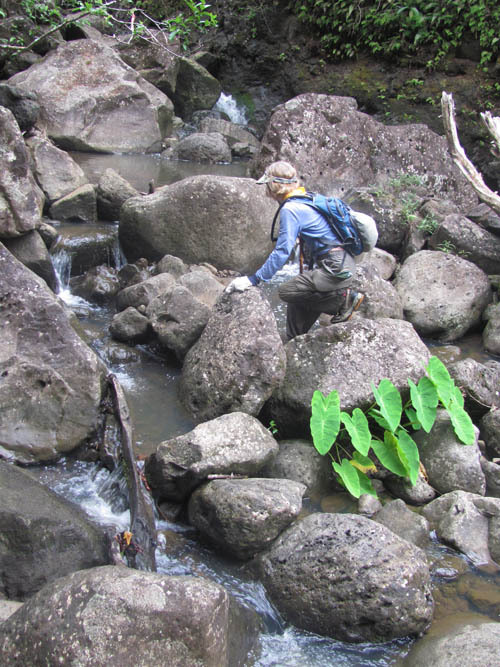 While making our way upstream we came across several kalo plants growing right in the stream, a sign that Hawaiians might have once lived in Koloa Gulch. 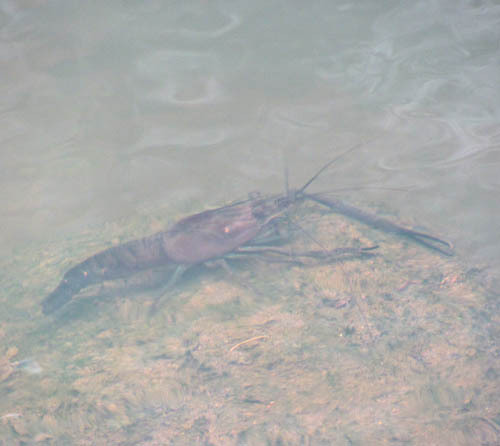 Many of the pools were home to Tahitian prawns which were introduced to Hawaii in 1956. These prawns can reach nearly 10 inches long and have long thin pincers. While the vast majority of plants in the gulch are introduce species, the deeper we got into the gulch the more native plants we saw. Haiwale (Cyrtandra sp.) — thrives along the banks of the stream far up the gulch. 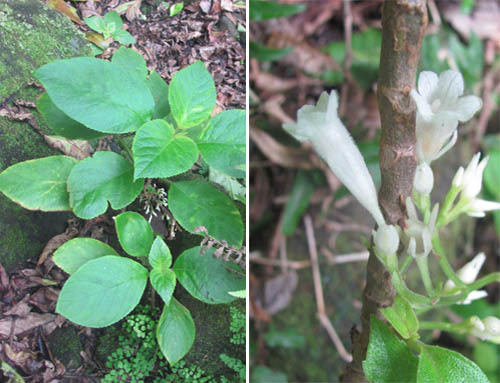 Several plants were in bloom with small white flowers hidden within its foliage. We were pleased when we reached our destination for the day — the pool at the end of the gulch! Just beyond the pool and small 6-foot waterfall is a much larger waterfall around the bend just out of sight. 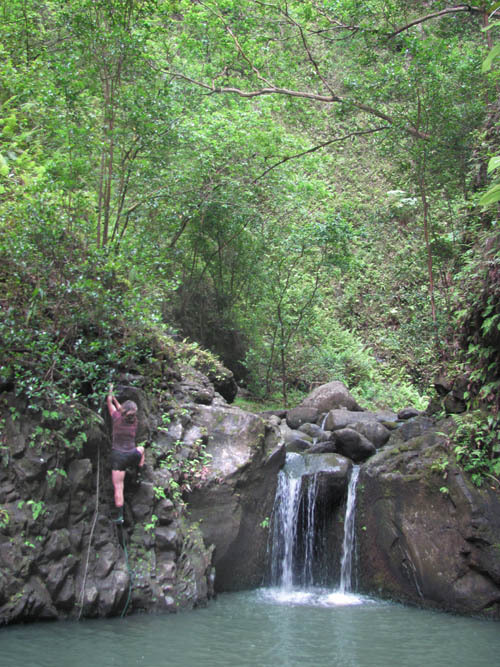 Several of us followed our hike leader — Thea — who climbed the rock face using a rope to reach the next level. The 40 foot waterfall had lots of water as it plunged into a pool at its base. Thea swam in the pool as Chris and I photographed the alluring sight. After splashing in the water, eating lunch, and enjoying each others company, we pushed off from the pool to return the way we had come. While making our way back downstream, I reflected on the great time we had admiring the ferns along the trail, hopping from boulder to boulder, and cooling off in the pools and waterfalls at the end of the gulch. 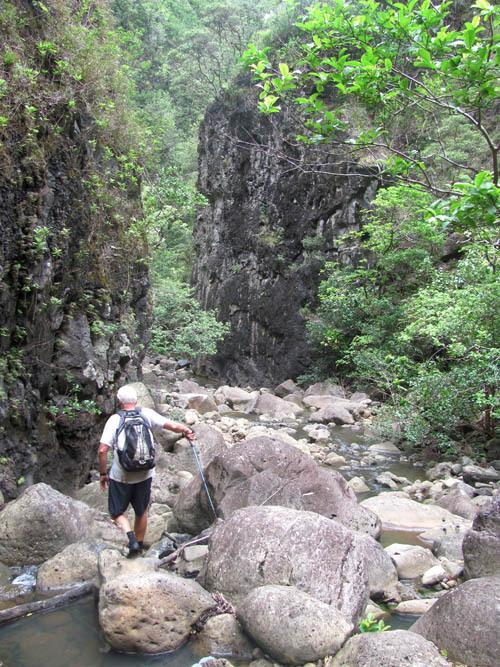 It is little wonder that Koloa Gulch is one of my favorite stream hikes on the island.